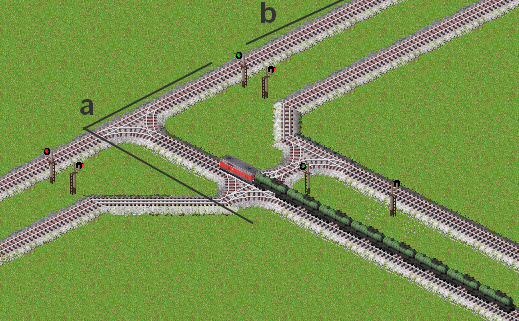 Networks of train/monorails/maglevs are often complicated and need signals to work well, otherwise trains would create jams. 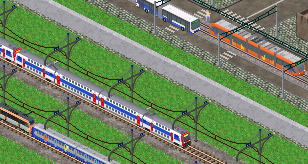 There will be only trains in this tutorial since trains'signals are same as monorail/tram/maglev's ones. Once the path is calculated until the next stop, a train reserves a track block until the next station or the next signal, no other train can reserve an already reserved block. 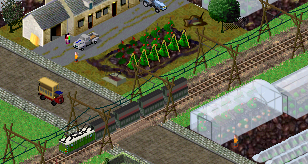 Reserved blocks can be highlighted with the keyboard shortcut “b” : Even if no signal separate reserved and non reserved track, a train can reserve the non reserved track. Most of the signals have three orientations : in the both directions and in only one the two directions. Click one, two or three times when building a signal to change its orientation. 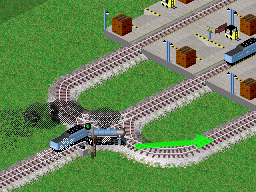 An oriented signal will prevent trains from passing throw it in the wrong direction. The presignal immitates the behaviour of the next signal (seems not to work with choose signals), so when a train arrives to a presignal, it must reserve the block between the presignal and the next one and the block after the second signal. The train proceeds only if the two next blocks are free. 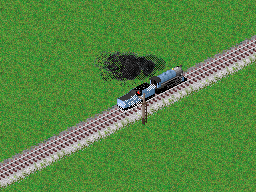 In some situations a train has to pass on a crossing only if it won't stuck it. 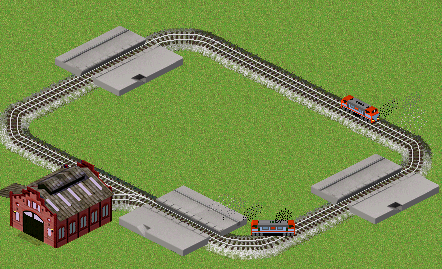 There, if the b block is taken, the train will stop in the a block and stuck the crossing, leading to a jam. 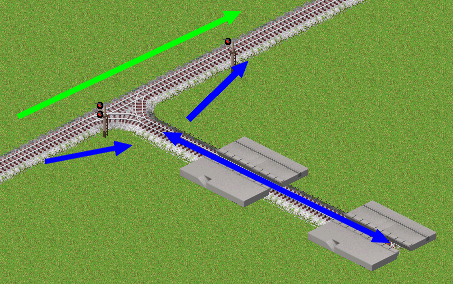 With the presignal, the both blocks must be free to allow the train to proceed so it won't stuck the crossing. A train has to wait for its platform to be free to enter a station but thanks to a choose signal it may use another platform of the same station if its platform isn't free : When the platform is free : no problem. 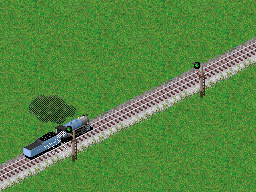 If the platform is taken, the train will use another one. 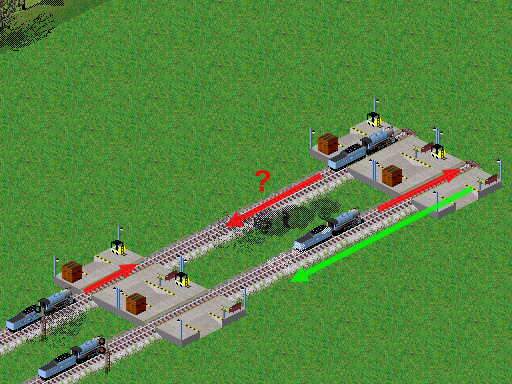 Using end-of-choose signals should be mandatory with complicated stations. Omitting them can induce disastrous jams because of trains attempting to reach platforms not planned for them (For instance, a train supposed to go on surface platforms tries to reach underground platforms by going to the underground network through a tunnel entry afar from the station). As written above, stations act like signals but in some cases it leads to a jam. 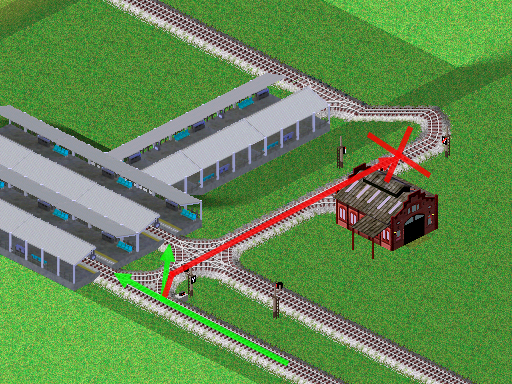 A train can't enter a reserved block even if there are stations if there is a long block signal, the train must reserve the block until the next signal despite the stations between them. 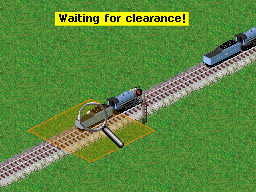 The train doesn't proceed if another train is already in the block despite the stations between them. 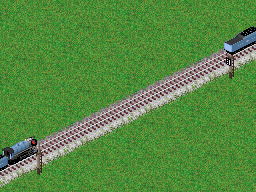 This signal doesn't cut a way in blocks, it just prevent trains to go in the wrong direction. 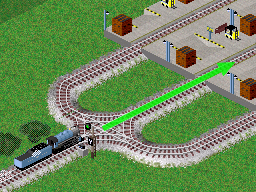 In this screenshot the train at the bottom doesn't proceed because the one way signal at the top right doesn't cut the way in blocks, the block the train must reserve stretches from the first signal to the signal after the one way signal. Next tutorial : Road signals.